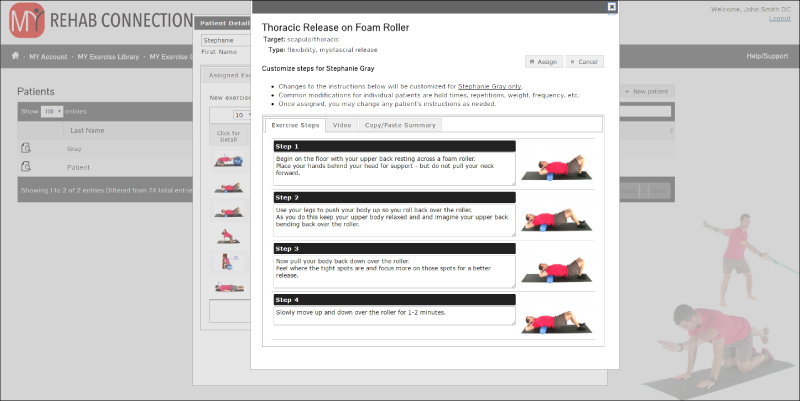 To prescribe an exercise to a patient click on the MY Patients tab from the top menu to open your list of patients. 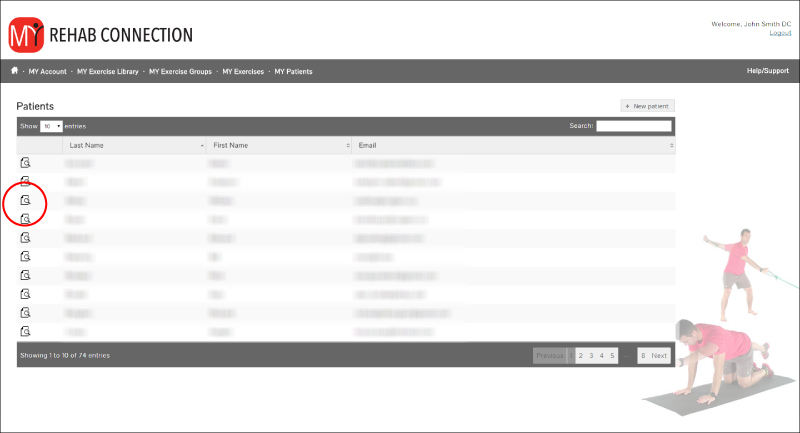 Then click the icon in the left hand column beside the patients name to open the patient’s file. You will now see the Patient Detail & Exercise Assignment window. By default the ‘Assigned Exercises’ tab is displayed. This is a list of the exercises currently assignment to the patient. You can prescribe an exercise to your patient by selecting the ‘Exercise Groups’, ‘Exercise Library’, or ‘My Exercises’ tabs located at the top of the Patient Detail & Exercise Assignment window . Selecting these tabs will display the exercises associated with the MY Exercise Library, MY Exercise Groups, and MY Exercises respectively. From any of these three tabs simply select the exercise you want to prescribe to your patient. As the exercise is selected you will see a window displaying the details of each exercise step (you can review the exercise video from this window as well). You are able to modify the exercise instructions from this window. This may include modifying the parameters of the exercise (sets, reps, times per day), any slight modifications for the exercise, or any specific notes or instructions for the patient. Any modifications you make will be applied only to that specific patient. Modifications will not affect other patients that have been prescribed the same exercise. Click the “Assign” button in the upper right corner of the Patient Detail & Exercise Assignment window and the exercise will be assigned to your patient.